A Red Cherry Shrimp tank can be a very interesting freshwater aquarium to keep. Watching freshwater aquarium shrimp can provide hours of fascinating entertainment. Keeping Red Cherry Shrimp in a species tank is a neat novelty that can be a great conversation piece. A Red cherry shrimp tank should be established, mature, well filtered and well aerated. It’s important to keep the water parameters stable and in the tropical fish community tank range. Ammonia levels and Nitrate levels need to be kept in check, and copper is to be avoided entirely as copper can be fatal to shrimp. Live aquarium plants help provide a stable and healthy environment for the shrimp giving them places to hide and explore. 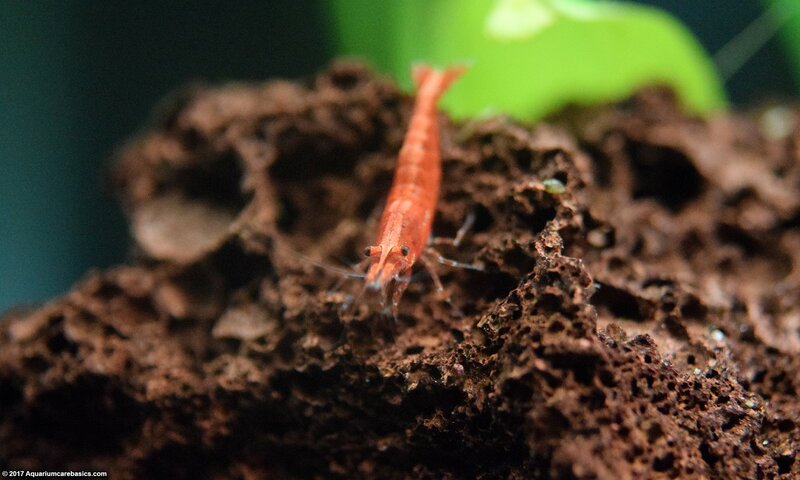 Live aquarium plants can also provide Red Cherry Shrimp with a continuous source of edible material, as aquarium plants shed edible matter into the water column. This plant debris settles on the bottom of the tank and the shrimp scavenge through it and feast. Live aquarium plants also provide Red Cherry Shrimp with food directly, as the shrimp pick dying plant matter off the plant itself. Red Cherry Shrimp also like feeding on some types soft green algae that grows on hard surfaces like aquarium glass and filter intakes. That’s why it’s good to keep them in tanks that have had a chance to mature. A Marimo Moss Ball is also a great addition to a Red Cherry Shrimp tank. A Marimo Moss Ball looks like a small round green plant, but it isn’t a plant at all. It’s a form of self contained green algae. The Red Cherry Shrimp will not eat the Marimo Moss Ball per se, but the shrimp will eat the little bits of food that that get trapped in the fibers on it’s surface. Essentially, a Marimo Moss Ball acts like a dinner plate in a Red Cherry Shrimp tank. Do Red Cherry Shrimp Eat Algae? It is often asked: Do Red Cherry Shrimp Eat Algae? The answer is yes. 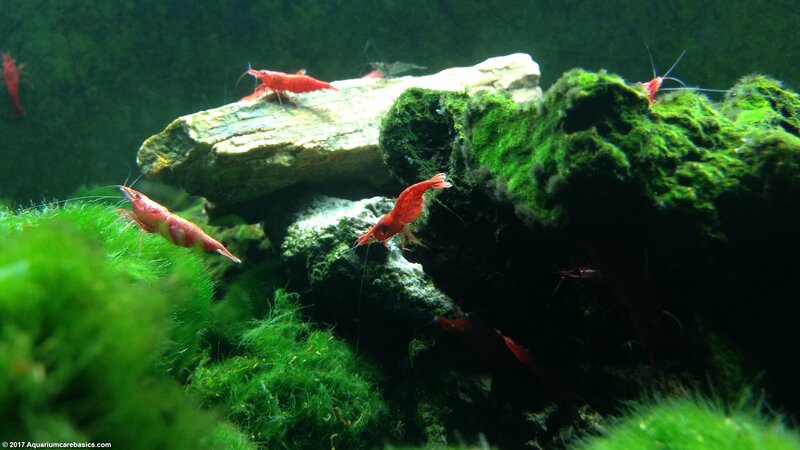 Red Cherry Shrimp eat algae that grows in an aquarium. They seem to like eating soft green algae and soft brown algae growing on hard surfaces in the tank. Such as on plastic filter intakes and decorations. Red Cherry Shrimp are very agile and nimble inhabitants of a tank. They are able to get into spots to scavenge for algae that some of of the larger shrimp, like Amano Shrimp, cannot get very close to. Red Cherry Shrimp are great little swimmers and can actually stand on the side of the tank as they eat algae off it. The shrimp can spend hours on end picking at the growth on the glass and feed to their hearts content. I always keep algae growth in check in my tank for aesthetic reasons. That said, I also like to keep a patch or two of algae growing on hard surfaces so my Red Cherry Shrimp have spots of green growth to feast on should the be interested. In addition to eating algae that occurs naturally in a tank, Red Cherry Shrimp should also be given supplements of other food such as fish flakes, pellets, algae wafers and even small pieces of blanched green zucchini. Red Cherry Shrimp eat algae in a tank. But they are not a solution to an algae growth problem in an aquarium. The overgrowth of aquarium algae is most often a symptom of a larger problem like poor water conditions and / or excessive light. If there is an algae bloom in a tank, don’t toss in a dozen Red Cherry Shrimp and call it a day. Instead, determine the underlying cause and / or causes and take measures to correct the issues.